We demonstrate the effect of scleral crosslinking with riboflavin and UVA on an axial elongation rabbit eye. Axial elongation was induced in 13 day-old New Zealand rabbits (male and female) by suturing their right eye eyelids (tarsorrhaphy). Dotan, A., Kremer, I., Gal-Or, O., Livnat, T., Zigler, A., Bourla, D., Weinberger, D. Scleral Cross-linking Using Riboflavin and Ultraviolet-A Radiation for Prevention of Axial Myopia in a Rabbit Model. J. Vis. Exp. (110), e53201, doi:10.3791/53201 (2016). Myopic individuals, especially those with severe myopia, are at higher-than-normal risk of cataract, glaucoma, retinal detachment and chorioretinal abnormalities. In addition, pathological myopia is a common irreversible cause of visual impairment and blindness1-3. Our study demonstrates the effect of scleral crosslinking using riboflavin and ultraviolet-A radiation on the development of axial myopia in a rabbit model. The axial length of the eyeball was measured by A-scan ultrasound in New Zealand white rabbits aged 13 days (male and female). The eye then underwent 360° conjunctival peritomy with scleral crosslinking, followed by tarsorrhaphy. Axial elongation was induced in 13 day-old New Zealand rabbits by suturing their right eye eyelids (tarsorrhaphy). The eyes were divided into quadrants, and every quadrant had two scleral irradiation zones, each with an area of 0.2 cm² and a radius of 4 mm. Crosslinking was performed by dropping 0.1% dextran-free riboflavin-5-phosphate onto the irradiation zones 20 sec before ultraviolet-A irradiation and every 20 sec during the 200 sec irradiation time. UVA radiation (370 nm) was applied perpendicular to the sclera at 57 mW/cm² (total UVA light dose, 57 J/cm²). Tarsorrhaphies were removed on day 55, followed by repeated axial length measurements. This study demonstrates that scleral crosslinking with riboflavin and ultraviolet-A radiation effectively prevents occlusion-induced axial elongation in a rabbit model. Myopia is the most common of the refractive disorders. The prevalence of myopia in the USA and Europe is reported to be around 30%, and in Asian countries it affects up to 60% of the general population1,2. Myopic progression occurs in up to 50% of myopes, usually at a rate of around -0.5 dioptres over a two-year interval3. The health costs imposed by myopia are considerable, including expenses for spectacles, contact lenses and refractive surgery and costs related to the increased health risks of glaucoma, cataract, retinal detachment and visual impairment4-6. In animal studies of myopia, sight reduction is induced by eyelid suturing7-10, placement of an occluder at a short distance from the eye and corneal tattooing11. However, for artificial myopia to occur in these studies, the occlusion process has to be performed on very young animals, as no sight deprivation experiments carried out on adult specimens have proved successful. One of the important features of severe myopia is a pathological change of the sclera with progressive thinning of the sclera, probably due to a disturbed feedback mechanism of emmetropization after visual deprivation12 or due to some metabolic disorder of the sclera, such as in Ehlers-Danlos syndrome13. Ultimately, both mechanisms lead to stretching and thinning of the sclera, retina and choroid due to structural abnormalities of the myopic sclera such as a decreased collagen fiber diameter14,15 and disturbances in fibrillogenesis16. Several studies have shown that impaired collagen crosslinking is an important factor in the weakening process of the myopic sclera17-18. Wollensak et al.19-21 induced collagen crosslinking by applying the photosensitizer riboflavin and ultraviolet-A (UVA) irradiation (370 nm) and noted a significant, 157% increase in the rigidity of porcine and human sclera in vitro19 and a 465% increase in rabbit scleral rigidity in vivo (Young's modulus)20. Crosslinking also had a long-term effect on rabbit sclera in vivo: rigidity increased by 320.4% after 3 days, 277.6% after 4 months, and 502% after 8 months (Young's modulus)22. Therapeutic attempts to arrest myopic progression have been published23-26 but the success of these methods is controversial. No efficient means of preventing progressive myopia has been found to date. The etiology of myopia is still controversial, and its treatment poses a challenge. On the basis of these findings, it is hypothesized that scleral crosslinking can serve as a means for sclera-based treatment of myopic progression. The purpose of this study is to examine the scleral collagen crosslinking effect on the development of axial myopia induced by visual axis occlusion. Animals were treated in accordance with the ARVO resolution on the use of animals in research. The study protocol was approved by the institutional Committee for Laboratory Animal Research (approval no. 022-4598-2; 021211). Weigh and anesthetize a 13 day-old New Zealand white rabbit with an intramuscular injection of ketamine hydrochloride 100 mg/ml (100 mg/kg) and xylazine hydrochloride 25 mg/ml (12.5 mg/kg). Those doses are used due to the length of the surgical procedure. Assure appropriate level of anesthesia by the lack of a pain reflex. Using a sterile cotton swab, apply a small amount of ophthalmic ointment to the non-operated eye to prevent the cornea from drying out. Apply 0.9% normal saline drops onto the operated eye cornea during the operation to prevent the corneas from drying out. Perform three axial length measurements in each eye after topical anesthesia (oxybuprocaine hydrochloride 0.4%) using an ultrasound A-scanner and then average the measurements. Apply the probe perpendicularly to the central cornea. Using surgical ophthalmic forceps and scissors under an ophthalmic operating microscope, make a 360° conjunctival peritomy with surgical ophthalmic forceps and scissors. Using an angled forceps or a muscle hook identify the four extraocular rectus muscles and isolate them with a 2-0 braided silk non-needled sutures. NOTE: The silk sutures will help with moving the globe in the desired direction. The eyeball is divided into quadrants between the four rectus muscles (four quadrants). Mark with a skin marker two zones in each quadrant, one at the equatorial sclera and one at the posterior sclera. These are the irradiation zones. Prepare a 3 ml to 5ml syringe containing 0.1% dextran-free riboflavin-5-phosphate. Connect the syringe to a 26 G lacrimal cannula or 25 G tapered hydrodelineator. Prepare the irradiation device which includes a UV A (370 nm) light source connected to a beveled down custom-made fiber optic. Following the measurement of energy power and calibration (see NOTE below), set the device to 57 mW/cm². Move the eyeball by pulling the silk sutures in the opposite direction of the chosen quadrant to be treated (e.g., Pull up and nasal when treating the lower temporal quadrant). Perform the eyeball movement using a 2-0 braided silk non-needled suture which isolates each rectus muscle. Apply photosensitizer solution containing 0.1% dextran-free riboflavin-5-phosphate onto the irradiation zone 20 sec before irradiation starts. Irradiate the irradiation zone using a beveled down custom made fiber optic for an irradiation period of 200 sec. Measure the area of each zone as 0.2 cm² with a radius of 4 mm. Apply photosensitizer solution containing 0.1% dextran-free riboflavin-5-phosphate onto the irradiation zone every 20 sec during the 200 sec irradiation period. NOTE: Perform the irradiation and the dropping of riboflavin simultaneously by two surgeons. Repeat steps 3.1-3.4 for each of the four eyeball quadrants. Shave the fur around the eye. Trim the lid margins using surgical ophthalmic scissors and then gently suture the upper and the lower eyelids using 4-0 braided silk ivory color - 3/8 circle reverse cutting- 13 mm length C-3 needle (tarsorrhaphy). Apply a small amount of ophthalmic ointment on the lid margin at the end of the procedure (chloramphenicol 5%). Keep the animals under a heating lamp during recovery. Do not leave an animal unattended until it has regained sufficient consciousness to maintain sternal recumbency. Place the animal in a clean cage with new bedding until it is fully recovered. After recovery, the animal will be returned to the animal room. Return the animal to his mother only when awake. During the first 48 hr, examine the animals concerning the general condition and signs of illness or infections. Administer analgesia as per section 1. Administer analgesia as needed if a change in the rabbit behavior is observed. (Metamizole drops 50mg/kg every 6 hr). Fifty-five days after surgery #1, weigh and anesthetize the rabbit with an intramuscular injection of ketamine hydrochloride 100 mg/ml (100 mg/kg) and xylazine hydrochloride 25 mg/ml (12.5 mg/kg). Using surgical ophthalmic scissors under an ophthalmic operating microscope, remove the tarsorrhaphy. Perform three axial length measurements on each eye after topical anesthesia (oxybuprocaine hydrochloride 0.4%) using an ultrasound A-scanner and then average the measurements. Apply the probe perpendicularly to the central cornea. Euthanize the rabbits with intraperitoneal phenobarbital sodium (200 mg/1.5 kg body weight). Figures 1 and 2 graphically demonstrate the axial length measurements of two groups. Group 1 rabbits underwent scleral crosslinking and tarsorrhaphy on the right eye while the left eye was not operated on (Figure 1). Group 2 rabbits underwent only peritomy and tarsorrhaphy on the right eye while the left eye was not operated on (Figure 2). 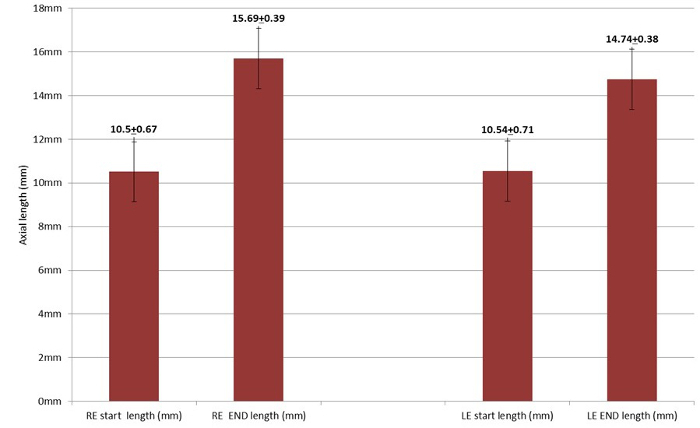 In group 1, which underwent scleral crosslinking and tarsorrhaphy, the mean axial length in the right eye measured 10.68 ± 0.74 mm before eyelid suture and 14.29 ± 0.3 mm 55 days later, for a mean difference of 3.61 ± 0.76 mm. Corresponding values in the unoperated/unsutured left eye were 10.70 ± 0.79 mm and 15.14 ± 0.32 mm, for a mean difference of 4.44 ± 0.81 mm (Figure 1). Comparison of the axial lengths of the sutured and unsutured eyes at the end of the occlusion phase revealed a lesser net increase in the sutured eyes. In group 2, which underwent only peritomy and tarsorrhaphies, mean axial length in the right eye measured 10.50 ± 0.67 mm before eyelid suture and 15.69 ± 0.39 mm 55 days later, for a mean difference of 5.19 ± 0.85 mm. Corresponding values in the unoperated/unsutured left eye were 10.54 ± 0.71 mm and 14.74 ± 0.38 mm, for a mean difference of 4.20 ± 0.67 mm (Figure 2). Comparison of the axial lengths of the sutured and unsutured eyes at the end of the occlusion phase revealed a greater net increase in the sutured eyes. Comparison of the mean change in axial length of the right eyes between group 2 (5.19 ± 0.85 mm) and group 1 (3.61 ± 0.76 mm) yielded a significantly lower value at the end of the occlusion phase (55 days) in the eyes that underwent the crosslinking procedure (p <0.001, nonparametric Mann-Whitney test). The between-group difference in mean axial length in the left eyes (4.20 ± 0.67 mm vs. 4.44 ± 0.81 mm) was not statistically significant (p = 0.39, Mann-Whitney non-parametric test). Figure 1. 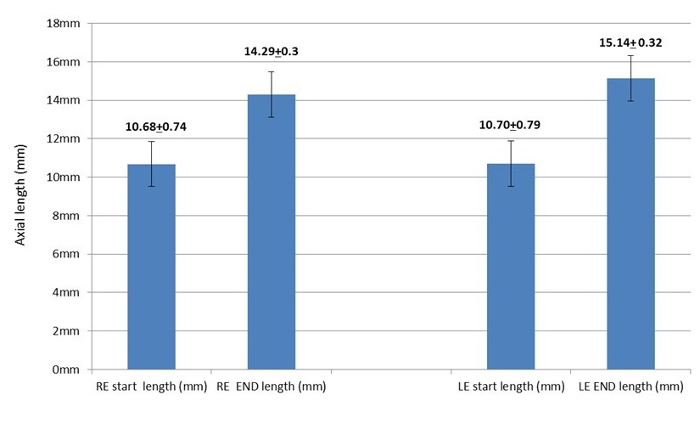 Right eye axial measurements before and after scleral crosslinking and tarsorrhaphy vs. left eye axial measurements. The mean axial length of the right eye before scleral crosslinking and tarsorrhaphy (RE start) and after removal of the tarsorrhaphy 55 days later (RE end). The mean axial length of the left eye at baseline (LE start) and 55 days later (LE end). The left eye was not operated on and was left open. The error bars indicates standard error of the mean. (Re-printed with permission from reference27). Please click here to view a larger version of this figure. Figure 2. Right eye axial measurements before and after tarsorrhaphy vs. left eye axial measurements. The mean axial length of the right eye before tarsorrhaphy (RE start) and after removal of the tarsorrhaphy 55 days later (RE end). The mean axial length of the left eye at baseline (LE start) and 55 days later (LE end).The left eye was not operated on and was left open. The error bars indicates standard error of the mean. (Re-printed with permission from reference27). Please click here to view a larger version of this figure. We present the first in vivo study of the prevention of axial myopia in a rabbit model using cross-linking technology with riboflavin and UVA irradiation. Although different laboratory animals can be used in this type of study, we chose rabbits mostly due to the size of the eyes and the need to perform crosslinking on the scleral surface. We found that exposing the rabbit sclera and suturing the upper and lower eyelids to be challenging procedures. We recommend trimming the lid margins and using the sutures mentioned in our protocol to ensure that the eyelids are firmly closed for the given period without need for corrections. One important thing to consider is the need to calibrate the irradiation device and the fiber optic for the required power energy. H&E histological slides revealed no toxic changes to the retina on eyes that underwent the crosslinking procedure. Further investigations should be performed to address the potential toxicity of riboflavin and UVA irradiation on the retina, choroid and sclera, with a focus on position, amount of energy and exposure time. Several limitations of this study warrant consideration. Only preoperative and postoperative axial lengths were measured. The axial length of the eyeball was measured by A-scan ultrasound. We did not evaluate biometric properties, refractive analysis or biomechanical properties of the sclera. Taken together, we think that the effect of scleral crosslinking with riboflavin and UVA on the axial elongation of the rabbit eye will have a positive impact on myopia research. The authors are thankful to Ms. Dalia Sela and Mr. Emi Sharon for their professional and excellent technical work in the laboratory. McBrien, N. A., Gentle, A. Role of the sclera in the development and pathological complications of myopia. Prog. Retin. Eye Res. 22, 307-338 (2003). Saw, S. M., Gazzard, G., Au Eong, K. -G., Tan, D. T. H. Myopia: attempts to arrest progression. Br. J. Ophthalmol. 86, 1306-1311 (2002). Bullimore, M. A., Jones, L. A., Moeschberger, M. L., Zadnik, K., Payor, R. E. A retrospective study of myopia progression in adult contact lens wearers. Invest Ophthalmol Vis Sci. 43, 2110-2113 (2002). Rose, K., Smith, W. E., Morgan, I., Mitchell, P. The increasing prevalence of myopia: implications for Australia. Clin. Exp. Ophthalmol. 29, 116-120 (2001). Saw, S. M., Gazzard, G., Shih-Yen, E. C., Chua, W. H. Myopia and associated pathological complications. Ophthal. Physiol. Opt. 25, 381-391 (2005). Tano, Y. Pathologic myopia - where are we now. Am. J. Ophthalmol. 134, 645-660 (2002). Greene, P. R., Guyton, D. L. Time course of rhesus lid-suture myopia. Exp. Eye Res. 42, 529-534 (1986). McBrien, N. A., Norton, T. T. The development of experimental myopia and ocular component dimensions in monocularly lid-sutured tree shrews (Tupaia belangeri). Vision Res. 32, 843-852 (1992). McKanna, J. A., Casagrande, V. A. Reduced lens development in lid-suture myopia. Exp. Eye Res. 26, 715-723 (1978). Shapiro, A. Experimental visual deprivation and myopia. Doc. Ophthalmol. Proc. Ser. 28, 193-195 (1981). Wiesel, T. N., Raviola, E. Increase in axial length of the macaque monkey eye after corneal opacification. Invest. Ophthalmol. Vis. Sci. 18, 1232-1236 (1979). Weiss, A. H. Unilateral high myopia: optical components, associated factors and visual outcomes. Br J Ophthalmol. 87, 1025-1031 (2003). 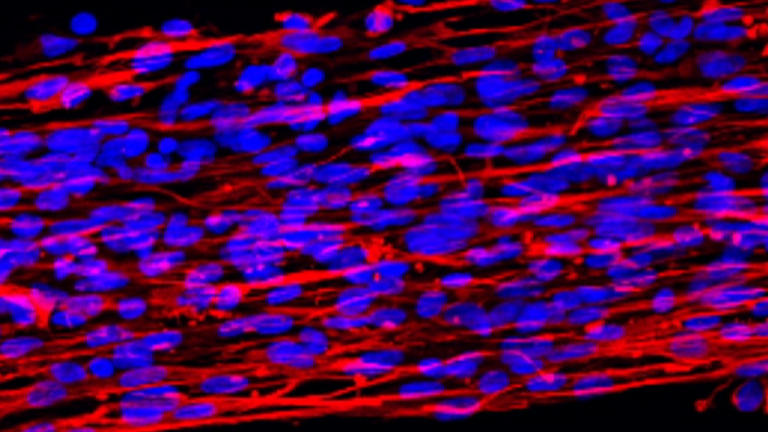 Mechanic, G. Crosslinking of collagen in a heritable disorder of connective tissue: Ehlers-Danlos syndrome. Biochem. Biophys. Res. Com. 47, 267-272 (1972). Curtin, B. J., Iwamoto, T., Renaldo, D. P. Normal and staphylomatous sclera of high myopia. An electron microscopic study. Arch. Ophthalmol. 97, 912-915 (1979). Liu, K. R., Chen, M. S., Ko, L. S. Electron microscopic studies of the scleral collagen fibre in excessively high myopia. J. Formosan Med. Assoc. 85, 1032-1038 (1986). Funata, M., Tokoro, T. Scleral change in experimentally myopic monkeys. Graefes Arch. Clin. Exp. Ophthalmol. 228, 174-179 (1990). McBrien, N. A., Norton, T. T. Prevention of collagen cross-linking increases form deprivation myopia in tree shrew. Exp. Eye Res. 59, 475-486 (1994). Iomdina, E. N., Daragan, V. A., Ilyina, E. E. Certain biomechanical properties and cross linking of the scleral shell of the eye in progressive myopia. Proceedings of XIVth Congress on Biomechanics. Paris: International Society of Biomechanics. 616-617 (1993). Wollensak, G., Spörl, E., Seiler, T. Riboflavin / ultraviolet-A-induced collagen crosslinking for the treatment of keratoconus. Am. J. Ophthalmol. 135, 620-627 (2003). Wollensak, G., Spörl, E. Collagencrosslinking of human and porcine sclera. J. Cataract Refract. Surg. 30, 689-695 (2004). Wollensak, G., Iomdina, E., Dittert, D. -D., Salamatina, O., Stoltenburg, G. Cross-linking of scleral collagen in the rabbit using riboflavin and UVA. Acta Ophthalmol. Scand. 83, 477-482 (2005). Wollensak, G., Iomdina, E. Long-term biomechanical properties of rabbit sclera after collagen crosslinking using riboflavin and ultraviolet (UVA). Acta Ophthalmol. 87, 193-198 (2009). Wildsoet, C. F., Norton, T. T. Toward controlling myopia progression. Optom. Vis. Sci. 76, 341-342 (1999). Avetisov, E. S., Tarutta, E. P., Iomdina, E. N., Vinetskaya, M. I., Andreyeva, M. I. Nonsurgical and surgical methods of sclera reinforcement in progressive myopia. Acta Ophthalmol. Scand. 75, 618-623 (1997). Thompson, F. B. A simplified sclera reinforcement technique. Am. J. Ophthalmol. 86, 782-790 (1978). Whitmore, W. G., Curtin, B. J. Scleral reinforcement: two case reports. Ophthalmic Surg. 18, 503-505 (1987). Dotan, A., Kremer, I., Livnat, T., Zigler, A., Weinberger, D., Bourla, D. Scleral cross-linking using riboflavin and ultraviolet-A radiation for prevention of progressive myopia in a rabbit model. Exp Eye Res. 127, 190-195 (2014).